This time of year, after I’ve been away from the over indulgence of the holidays for a few weeks, my sweet tooth cravings return, and I find myself longing for crème brûlée. I’m not sure why my stomach and head make that connection each January and February, but I like to just roll with it. Why deny myself such a simple pleasure? 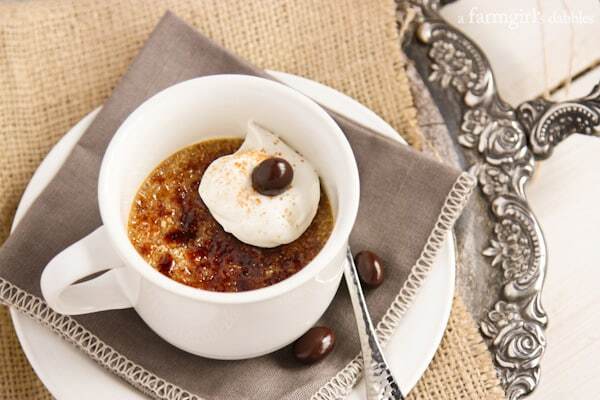 This Cappuccino Crème Brûlée is a riff on my family’s favorite Almond Vanilla Bean Crème Brûlée. The deep rich coffee flavor is to die for. Well, at least that’s what I think. The rest of my family does not agree. They find my love for coffee flavored desserts confusing, and dare I say annoying, as they distract me from making them something they can enjoy, too. To that I say, too bad so sad. 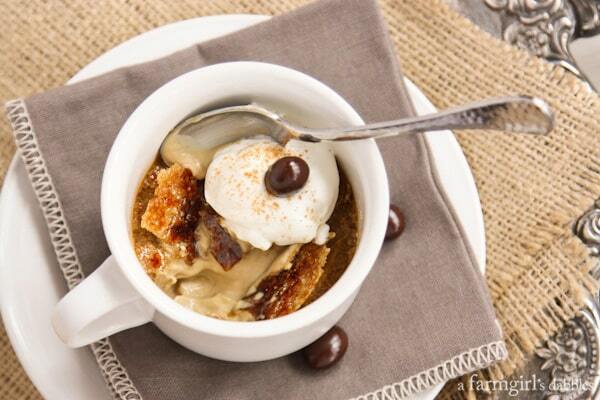 Coffee flavored desserts make Momma happy. And I simply cannot deny you, my fellow coffee flavored dessert lovin’ friends, this awesome recipe. I do believe she was right. The coffee cups make the perfect statement. 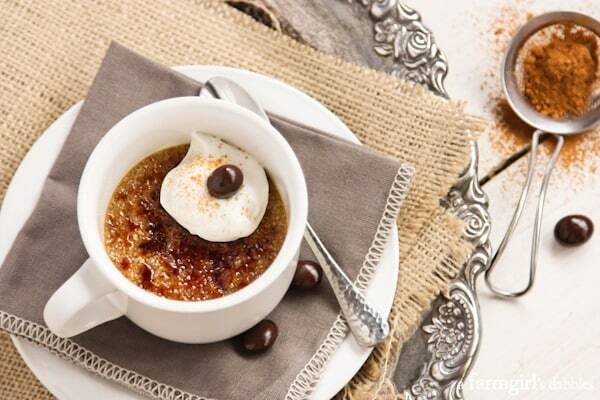 This Cappuccino Crème Brûlée makes me smile from head to toe. Is that even possible?! Its flavor is deep and rich, more in tune to adult taste buds. The Kahlúa liqueur is not a timid ingredient in this cup, most certainly, and for that reason I really don’t feel right about serving this to our young girls anyway. So the girls and I also stirred up a batch of the almond vanilla bean crème brûlée, since Hatti has been craving crème brûlée, too. Cappuccino for me. Almond vanilla bean for the girls and Blake. It’s how we achieved family harmony this past weekend. 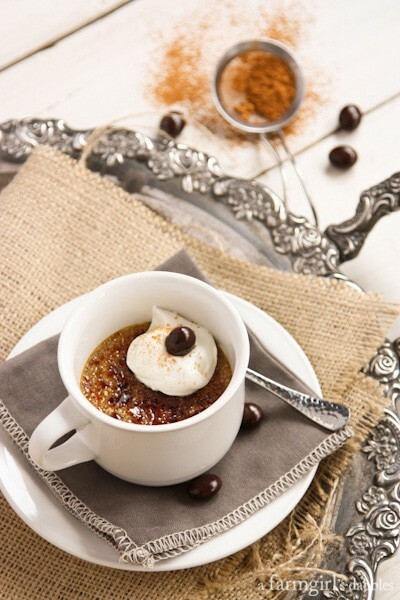 Creamy and luxurious, with a brittle caramelized topping that is oh so fun to break through, this Cappuccino Crème Brûlée is just the perfect excuse to gather a handful of coffee lovin’ girlfriends together. Pour Kahlúa and vanilla into a small to medium sized bowl. Add espresso powder and whisk until dissolved. Stir in cream. In a medium bowl, briskly whisk the egg yolks until pale in color, about 1 to 2 minutes. Add 1/3 cup brown sugar and cinnamon, and whisk until sugar dissolves, about 2 minutes. Gently whisk in the cream mixture, just until combined. Place 6 small oven safe coffee cups (mine have a 1 cup capacity) in a baking pan. Divide the cappuccino custard mixture evenly between the 6 cups, allowing at least ¼’’ of head space for the sugar topping. Pour warm water into the pan to come halfway up the sides of the cups. Bake in the oven for 60 to 65 minutes, or until center of each custard still jiggles just slightly. Remove from the oven and lift the cups from the hot water. Let cool for about 20 minutes on the counter, then refrigerate for at least 2 hours or up to 2 days. When ready to serve, place the cups on a baking sheet. Evenly sprinkle 1 teaspoon raw sugar over each custard. With a hand-held torch, caramelize the sugar until it is browned evenly. Serve with a small dollop of freshly whipped cream, a dusting of cinnamon, and a chocolate covered coffee bean or two. 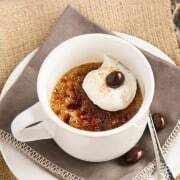 Note: If using a more standard shaped dish for crème brûlée, one that is wider and allows the custard to be shallower, baking time will need to be lessened and adjusted accordingly. You will also want to add more raw sugar to the top of the baked and cooled custards, as the surface area is larger than when using the coffee cups. Adapted from my family’s favorite Almond Vanilla Bean Créme Brûlée.